If you want to play along, simply make a paper project (card, scrapbook page, or 3D item) that includes the colors indicated with the jewelry piece. (If you don't have the exact colors, just use ones that are similar:) Then, submit your creation to me by Saturday, June 20th at 11:59 P.M. using the Mr. Linky box at the end of this posting. You may also wish to post your photo at Splitcoaststampers.com using the keyword JCI. All of you who participate in the challenge will receive recognition next Sunday...plus I will be giving away a stamp set called Bitty Basics that has several whimsical little images (star, heart, butterfly, etc.) and coordinating greetings (hello, thanks, etc.) So what are you waiting for...join the fun! I can't wait to see what you come up with! The colors of last week's piece, were soft and subtle...so, this week I went for a more bold and fun piece. These Fiesta Earrings were found on the Jewelicide etsy shop. You'll definately like this designer's "one of a kind" work! I finally had a chance to focus and make my own JCI41 card. 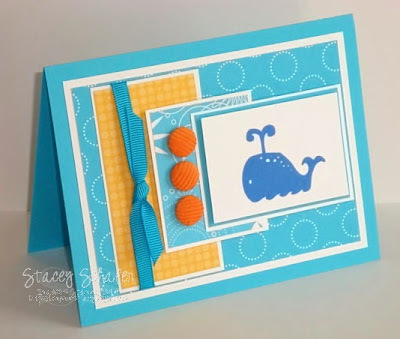 I used the sketch challenge #233 from Splitcoaststampers to get me started with these fun colors. Can't wait to work with these colors! Your gift arrived here! Thank you again--and the card was so beautiful! Aye carrumba! 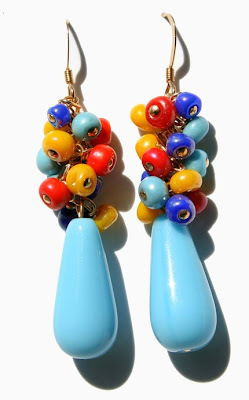 I am loving these earrings and colors! I just posted my card for your fabulous color challenge! Thanks for inspiring me! These colors were a lot of fun to work with, especially on a dreary rainy day! 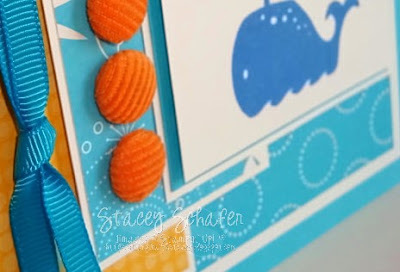 What fun colors this week Stacey!